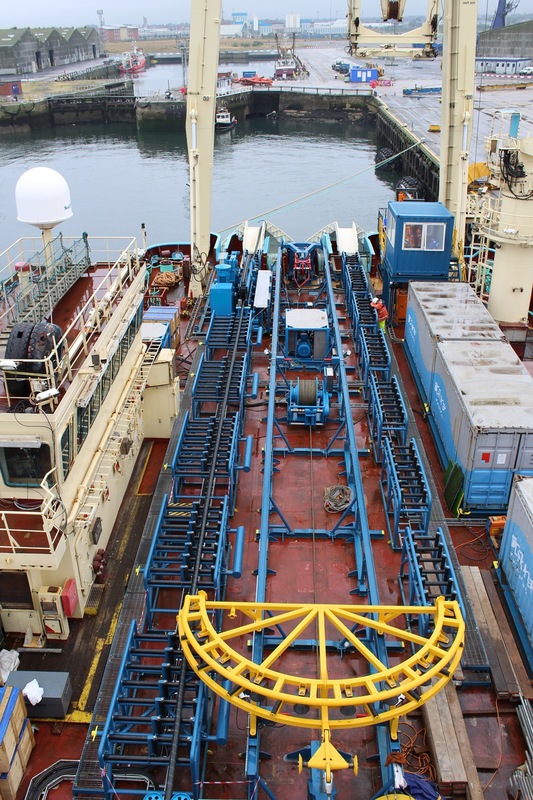 A state of the art quadrant handling system, designed and built by Osbit for offshore contractor DeepOcean, has successfully completed its first inter array cable installation job for a leading international developer. The system has delivered class-leading efficiency, successfully facilitating the laying of two complete cables per day in the first stage of its deployment from the Maersk Recorder vessel at an east coast wind farm. Osbit modified its existing system to fit an entirely new deck layout, incorporating operator-owned equipment alongside its own. The company also upgraded its equipment to add additional functionality, including the addition of two new stern chutes and associated grillages. A novel quadrant handling A-Frame was also integrated, to streamline the most complex handling operation throughout the whole lay cycle. These changes helped to support the safe and effective 1st and 2nd end deployment of the subsea quadrant, as it installed the offshore wind farm inter array cables. The equipment was also crucial in minimising on-site costs, accelerating the deployment process to achieve a lay rate of at least two complete cables per day. Osbit’s design also allows the system’s cable production units to be assembled offline on the system while it carries out laying operations, maximising technician productivity on board the vessel. Pierre Boyde, Commercial Director at DeepOcean, said: “Osbit’s understanding of our requirements and its engineers’ expertise has produced one of the most advanced quadrant handling systems on the market. The system gives DeepOcean an advantage over our competitors in multiple key areas, including speed, and personnel and product safety”.